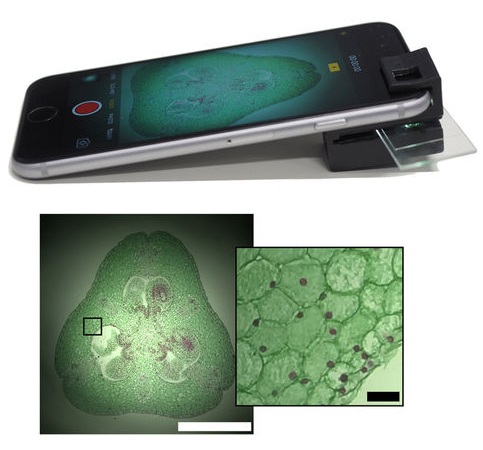 The smartphone microscope is powerful enough to visualise specimens as small as 1/200th of a millimetre, including microscopic organisms, animal and plant cells, blood cells, cell nuclei and more. The clip-on technology is unique in that it requires no external power or light source to work yet offers high-powered microscopic performance in a robust and mobile handheld package. The researchers behind it - from the ARC Centre of Excellence for Nanoscale BioPhotonics (CNBP) and RMIT University - are making the technology freely available, sharing the 3D printing files publicly so that anyone can turn their own smartphones into microscopes. The technology has immense potential as a scientific tool, especially for use in remote areas and for field-work where larger standalone microscopes are unavailable or impractical. “We’ve designed a simple mobile phone microscope that takes advantage of the integrated illumination available with nearly all smartphone cameras,“ says lead developer and CNBP Research Fellow at RMIT University, Dr Antony Orth. The clip-on has been engineered with internal illumination tunnels that guide light from the camera flash to illuminate the sample from behind. This overcomes issues seen with other microscopy-enabled mobile phone devices, Dr Orth says. “Almost all other phone-based microscopes use externally powered light sources while there’s a perfectly good flash on the phone itself,” he explains. The clip-on also enables both bright-field and dark-field microscopy techniques. Bright-field microscopy is where a specimen is observed on a bright background. Conversely, dark-field shows the specimen illuminated on a dark background. “The added dark-field functionality lets us observe samples that are nearly invisible under conventional bright-field operation such as cells in media,” Dr Orth says. Dr Orth believes the potential applications for the smartphone microscope are enormous. It could also benefit developing countries. “Powerful microscopes can be few and far between in some regions,” says Dr Orth. The 3D printing files for the microscope clip-on are available for download at the CNBP web site. More details are available in a research paper on the device.